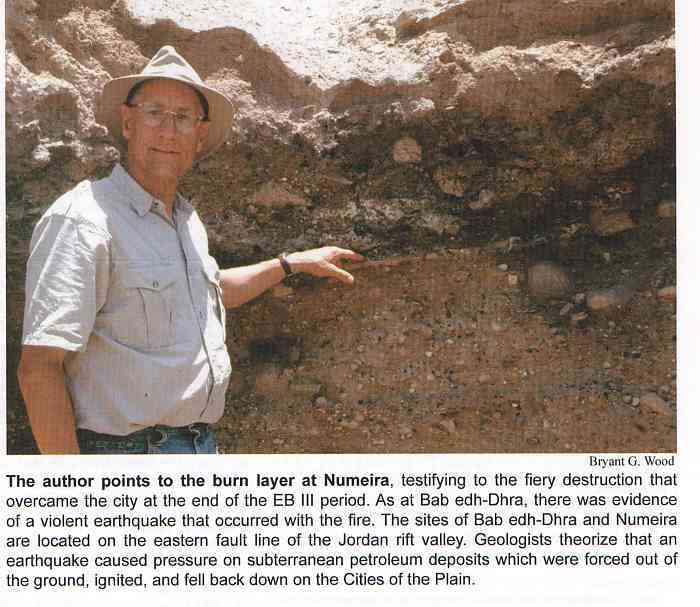 Bryant G. Wood is an archaeologist who has proposed the most likely sites for the ancient cities of Sodom and Gomorrah. 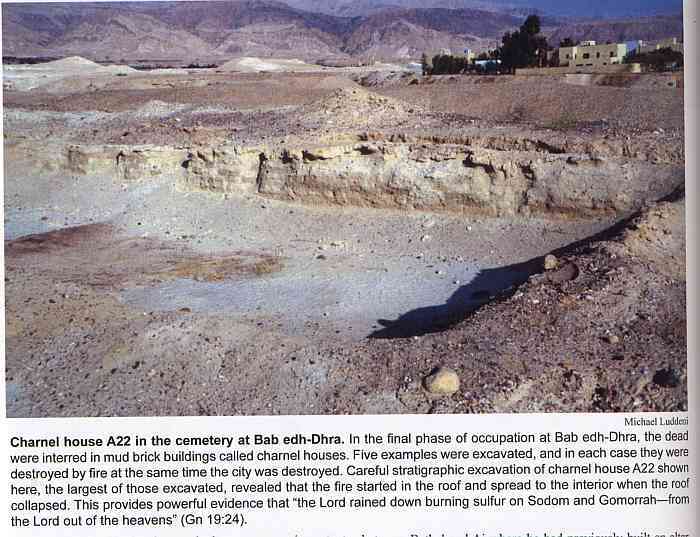 His article, "The Discovery of the Sin Cities of Sodom and Gomorrah" first appeared in the Summer 1999 issue of the archaeological magazine, Bible and Spade (Vol. 12, No. 2). That magazine article was republished online on April 16, 2008 by Associates for Biblical Research. The following map was published in the online edition. I have reproduced it here with some additional comments. If you click on the map, you will be directed to the online article by Wood. Map of the area south of the Dead Sea, showing the proposed locations of the Biblical Cities of the Plain, or more literally, "Cities of the Circle." 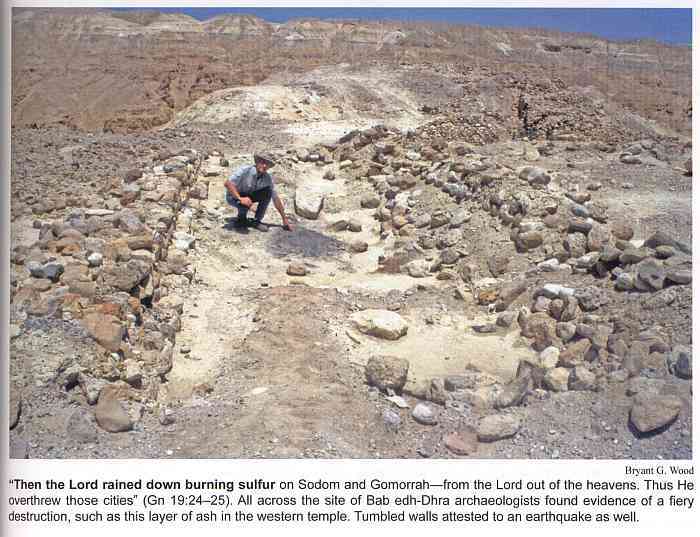 Sodom is likely Bab edh-Dhra; Gomorrah, Numeira; and possibly, Zoar is Safi. Two other city sites, Feifa and Khanazir, may also be included among the five confederate cities of the district of the Siddim Valley (Gen. 14:2-3). The following images were photocopied by Accuracy in Genesis from the original Bible and Spade article. They are reproduced here so the reader can easily and directly view the proposed sites. The following is a quote from the author of the Accuracy in Genesis article. 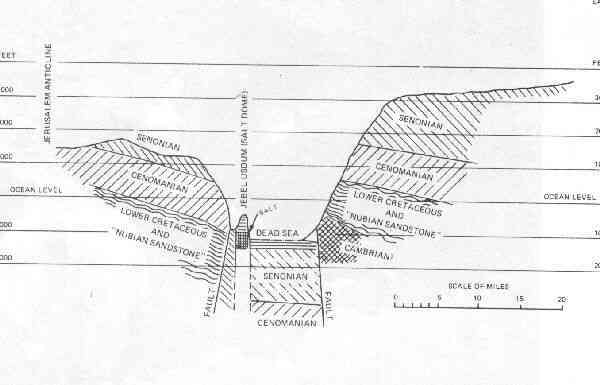 It summarizes Bryant G. Wood's theory that there was an earthquake at the time of the demise of the cities of Sodom and Gomorrah. The theorized earthquake somehow ignited the tar (chemar, 2564, "pitch, bitumen, asphalt") pits (Gen. 14:10) of the region. The resulting explosion hurled the burning masses of tar skyward. They then descended upon the cities of the circle, burning them. The Scriptures say that Abraham looked and saw "the smoke of the country went up as the smoke of a furnace" and does not seem to mention a quaking, but does use the Hebrew term for "overturning" in Deuteronomy 29:23. Possibly this is an indication that the earthquake proposal is valid. Changes of elevation of up to 164 feet have been noted which caused a change in direction of the Wadi Numeria at the site, which is believed to be the event that caused the destruction. Also found were evidences that the residents hastily fled the site and buried skeletons of those who were caught in the destruction. Just how a proposed earthquake could have ignited the tar pits (Gen. 14:10) is never made clear by Wood. Clearly the text of Genesis states that it was Yahweh who "rained on Sodom and Gomorrah brimstone (gophrith, 1614, i.e. sulfur) and fire out of heaven" (Gen. 19:24). So this was a supernatural event. In the present author's view an earthquake at the time of God's judgment by fire and sulfur is not essential to the Biblical historical account. That there was an earthquake along the fault line at some point is indisputable. That the earthquake and the fiery conflagration occurred simultaneously is both unprovable and unnecessary. It is more likely, in the Biblical account, that the fiery conflagration from Yahweh ignited the bitumen pits (Gen. 14:10) than it is that an earthquake ignited the bitumen pits. The resulting mixture of burning buildings, vegetation, and bitumen over a wide-spread area would have created heavy, dark smoke ascending into the heavens as witnessed by Abraham (Gen. 19:27-28).